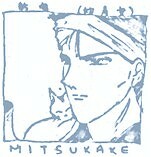 Character: Mitsukake seldom talks. Since he doesn't show his feeling much, people findhime pretty difficult to approach. He is only too shy to express his personal feelings. He treats the elderly, animals and the sick with great care and love. He is calm and gentle. He still misses his passed away lover till this moment.